Lovers of Schumann will be perplexed at the title of this disc, which is a contradiction in terms. Schumann wrote almost no music for cello and piano. One of the few pieces that he did write for the instrument, apart from his Cello Concerto, was destroyed by his wife Clara, who feared it betrayed signs of her husbands insanity. 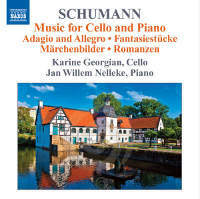 So what we have on this new disc from the fine cellist Karine Georgian (who, as long-time readers will know, I believe to be underrated) is a collection of transcriptions and arrangements, several of them made by Georgians accompanist, Dutch pianist Jan Willem Nelleke. They are gorgeous, and the reason they work is that the quintessentially song-like character of Schumanns melodies makes them comfortably and effectively adaptable to the soaring and intimate lyrical potential of the cello. The collection includes the Marchenbilder, the First Violin Sonata, the Fantasiestucke and the Three Romances. Beautiful music of the soul and from the heart. Despite his love of the cello, Schumann left little music for it, but there are abundant arrangements of pieces he wrote for other instruments. This disc demonstrates how at home Schumann sounds on the cello, especially in the hands of a performer as charismatic as Georgian. She brings out the inspiration of the long, languorous melodic lines, heard to spellbinding effect in the Adagio and Allegro and the three Fantaisiestucke. Nellecke provides arrangements of the quixotic Violin Sonata No.1 and Clara Schumanns Three Romances, while the Four Fairytale Pictures for viola and piano, alternatively rapturous and ruminative, are heard in a version by Robert Hausmann, a cellist well known to Brahms. I was taken aback by how much I enjoyed this disc. Also a first is Nellekes arrangement of Roberts first violin sonata for cello, which he penned especially for Georgian. This is a piece somehow both playfully serious and seriously playful; the Allegrettos cheery nature defies its long, legato curves and the third movement, Lebhaft, fullires along into an intricate ending flourish. Märchenbilder Op 113 shows off Georgians way with the bow  her bites and digs often produce a fantastically brittle, cutting sound. Though theres little truly remarkable or unusual about this disc  after all, what do you expect from top-notch musicians performing well-rehearsed highlights from the canon other than fearless, flawless playing?  theres much to be said for just absorbing an extremely solid performance and not feeling the need to question whats new or genre-pushing about it. While Works for Cello and Piano isnt released until March, its currently downloadable in its entirety from Naxos online music library. If youre not already a member, sign up and have a listen. Karine Georgian is a most accomplished cellist with a rich, sonorous tone and exemplary intonation in the Suites, pinnacle of the instruments repertoire. She negotiates the multi-stopped chords of the final Gigue, a metrical graveyard for many, with barely a moments disturbance of the pulse. Her approach is, though, solemn, respectful and rather old-fashioned. For instance, she plays Bachs written chords at the end of the second Prelude, though few nowadays doubt that they are a shorthand for continuing the movements broken-chord semiquavers. Tempos are deliberate, dances stately rather than energetic. At best, they are deeply moving, for example the sixth Sarabande (for me the most inspired of all 36 movements in the Suites). But the third Sarabande, in a performance that clocks in at 5.05, lacks impulsion  Steven Isserlis, my benchmark, completes its gently undulating steps in under four minutes. Yet, however slow a dance may be, Georgian never loses its underlying pulse. Bach specifically chose the transparent gambas for the three Sonatas in which harpsichord provides matching upper line and bass. Performed with cello, balance rather disadvantages the keyboard. So, for example, after the final movement of BWV 1027 opens with harpsichord alone, the cello entry is intrusively overpowering. These are lively performances though carefully recorded to compensate for the disparity between period harpsichord and unashamedly modern cello. It is hard now to imagine a time when only a single recorded version of the unaccompanied Suites was available. Whilst I still return to those Casals recordings with immense pleasure it is always good to be able to welcome the many new versions, each shedding new light on these fascinating works. I have no idea how many are currently available or whether it has yet reached treble figures, but I do remember that as recently as 1999 a recording by Susan Sheppard (no relation) was advertised as being the first by a woman. Intriguing as that version I remain unclear whether its virtues were in any way due to the performers gender. Certainly it is hard to see that its more rhetorical approach had much in common with the present version so as to suggest that there is a specifically female way of playing the Suites. On the contrary, this version shows, yet again, the extraordinary way in which they offer the player possibilities to demonstrate the range of his or her musical imagination and sensitivity. I have enormously enjoyed performances from many distinguished players of widely differing approaches, and am very happy that Karine Georgian is now one of that number. At the risk of making these recordings sound dull, I should begin by saying that there is no unique selling point to these discs, no oddity of performance that the reviewer can seize upon. On the contrary, what struck me throughout was the players wise choice as each hurdle of performance decisions was reached. Rhythms are allowed to be flexible, but not to the extent of losing touch with the essential flow of each movement. Dynamics are kept within a relatively tight rein. Repeats are taken when asked for, and although Ms. Georgian clearly has a wide palette of articulation available, she uses it for essentially musical rather than showy purposes. I hesitate to use the word sensible as that might suggest some dullness or lack of imagination in these performances, but they are sensible in presenting the essential line and character of each Suite without fuss but with great finesse. It helps that Ms. Georgians tone is of considerable beauty and her intonation beyond reproach, and that the recording sounds close but manages to avoid picking up incidental sounds. The Sonatas have also been the subject of many recordings in recent years, mainly using the viola da gamba rather than the cello. As this was the instrument for which they were written this is unsurprising, but it is a pleasure to hear them once again on an instrument with a greater tonal range. The problem in these works is usually one of balance and it has not been entirely solved here. Effectively they are trio sonatas, with two upper lines and a bass line  the G minor Sonata does indeed exist in a version for two flutes and continuo. If you want to be able to hear a real equality of the upper lines you have to go to that version. There is an inherent difficulty in balancing a line played on a sustaining instrument such as the cello with one played on the harpsichord. At times here the former does tend to obscure the latter. Nonetheless the balance overall is better than on many rival versions, helped by Ms. Georgians great care over articulation and avoidance of excessive vibrato on long held notes. I thoroughly enjoyed all three works and was left wanting more. There is indeed room for more on the disc but given that the set can be obtained at a bargain price it is perhaps churlish to complain. The enormous number of competing versions means that no one recording of either set of works could sensible be said to be an automatic first choice. This set does nonetheless have formidable virtues. These may not be the most exciting versions of the Suites in particular, but I am not sure that excitement is an important virtue in these pieces. Much more important is sensitivity to their style and musical line, and this is something that these recordings most certainly do have. If you want a version that is wise, companionable and mature in its response to the music this is a set well worth investigating. Karine Georgians Bach Suites make quite a contrast [to Angela East on the Red Priest label]. With long, free-flowing lines and consistent fine tone (recorded in a silvery church acoustic) they are as easy on the ear as Easts are attention-grabbing. There is far less variety here, fewer clever ideas, but cello playing at this level of natural elegance and love of life will always make the music sound great. Georgian tries in her booklet interview to distance herself from the Romanticism of the Russian school (she is a Rostropovich student) but the gloriously intense singing of the Sarabandes rather gives her away. There is a bonus in the Gamba Sonatas but the cello and harpsichord are not an ideal sonic match on this occasion, and the performances are feel somehow less engaged. The Suites are joy enough. Awaiting my return was a pile of CDs for review, reference, column, features or whatever. Top of the heap were two new Bach recordings. The first I turned to was a recording of the six suites for unaccompanied cello and the three sonatas for viola da gamba and harpsichord, all on a three-CD set. What intrigued me was the fact that the cellist is Moscow-born Karine Georgian, and talking to myself (as I do, Im afraid) I said: Well, hello, long time no see. I know she was in Glasgow a year or so ago making a brief celebrity appearance in the now-defunct drive-time concert series at Oran Mor, but other than that at some point in the last 20 years she had slipped off my radar. Time was she seemed to be a regular guest in Scotland. I loved her playing: it was deep, rich and soulful, as the best cello playing should be. I reckoned she was heading for the top. I learn from her biog she settled in the UK 30 years ago, and teaches at the RNCM in Manchester. Well here she is on the SOMM label, as strongly flavoured and super-confident as ever, and ploughing a wonderfully fertile furrow of expression in the six suites. In the gamba sonatas she is accompanied by harpsichordist Gary Cooper, the hottest property there is on that instrument, and clearly the dazzling Mr. Coopers thinking has had a profound influence on Georgians playing. Bach composed, or more probably compiled, his six Cello Suites soon after 1720. Since there is no autograph, we are reliant on several later copies, the earliest of which is an error-strewn manuscript, dating from the late 1720s,, by Anna Magdalena, Bachs second wife. So, cellists who perform this music are dependent onn the edition they choose and must make their own decisions regarding bowing and articulation. 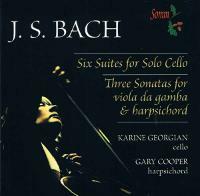 As I have known and admired the playing of Karine Georgian, admittedly in romantic and modern repertoire, I sat down to listen to this three-disc set of all Bachs solo cello and viola da gamba music with a keen sense of anticipation. Its from the perspective of the nineteenth and twentieth centuries that she approaches these timeless works. Georgian employs a full-toned sound and there is plenty of rubato to give her cello the chance to sing. Each of the six Suites consists of a Prelude followed by a sequence of old dances: Allemande, Courante, Sarabande and Gigue, with a pair of Minuets or Bourr&eeacute;es or Gavottes (the contemporary dances) inserted before the Gigue. Its in the Preludes that Bach allows his imagination full rein. Since the single line has to convey both melody and accompaniment  with all its harmonic implications  there is much scope for arpeggios, rapid passage-work and wide leaps, with the occasional double-stopped chords. This is not to suggest that the dances do not require a considerable technique too. While they may have become stylised in Bachs hands, performers still need to remember their origins. Georgian seems to take her time coming to terms with this music. I find the Sarabande of the First Suite unbearable slow. There are moments when the music seems to be coming to a halt. Yet the pair of Minuets and the Gigue that follow are delightfully characterised. Again, in the Third Suite, the Sarabande is so slow that the music stands still. The Fifth Suite is unusual in that Bach asked for the top string to be tuned a tone lower than usual. This would have made some of the double-stoppings in this C minor Suite more straightforward and altered its tonal colour. After a slow introduction, the Prelude becomes a fugue in which Georgian characterises the different voices beautifully. By the Sixth Suite, originally written for a five-stringed cello, her playing has really caught fire and the relishes the string-crossing and the high tessitura of the Prelude. Her playing of the Allemande has an elegance that recalls the Bach scholar Karl Geiringer describing it as a slow and pensive piece of great beauty. The Courante has a technical virtuosity that takes the breath away and the Gige has the real feel of a dance. 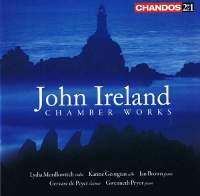 The third CD of this set is given over to the three Sonatas for the six- or seven-stringed viola da gamba and harpsichord, in which Georgian is ably accompanied by Gary Cooper. By Bachs time the viola da gamba was already falling into disuse. Bach, though had a fondness for it and may even have played it, since one is listed in the inventory of his effects after his death. He certainly wrote a considerable body of music for it, including important parts in the Sixth Brandenburg Concerto and the St. Matthew Passion. It seems unlikely that the sonatas were conceived as a set or were even original compositions for the gamba. Many of the movements occur in versions for other instrumental forces. The nature of the writing is similar to the Trio Sonatas in that the solo cello takes one line and the harpsichord writing is mainly in two parts with a melodic line and a bass. Each Sonata is in three movements and the music gives ample opportunity for Georgian to display her beautiful singing tone. In an interview in the accompanying booklet, she says how much she has modified her view of Bach since moving to the West from her native Russia. I believe that she has now found an acceptable middle road between the period cellists annd the arch-romantics. While I find her tempos for some of the slower movements in the Suites too slow, there is a great deal to admire in her playing of this music. She certainly has the technique and the tonal quality to bring the quicker movements to life. I particularly like this performance of the G minor Sonata, for its passion and its joie de vivre. Karine Georgian plays Bachs complete Cello Suites with measured dignity and a feeling of spaciousness unfettered by time. Her tone is warm and full without being in any way extrovert, carried along by a softly resonant acoustic. There is a restrained energy in her performances, which, although they can dance and sparkle  the Courante of the Third Suite trips along in fine style  are often measured and meditative. Here playing beautifully simple, with a minimum of rubato. Gary Cooper joins her at the harpsichord for spirited performances of the three viola da gamba sonatas BWV 10271029, of similarly unassuming master. It is a very satisfying set. Though his focus shifted from more intimate chamber works early in his career to more ambitious, large-scale compositions later in life, the influence of the Hungarian folk idiom was pervasive in Zoltán Kodálys writing. Two of the three works on this Alto album  the Op. 7 Duo for violin and cello and the Op. 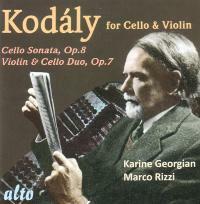 8 Sonata for solo cello  are among Kodálys most recognizable and frequently performed chamber works. In the case of Op. 8, it also represents an apex in writing for the solo cello, combining the harmonies and rhythms of Kodálys homeland successfully with some of the most demanding technical requirements in the instruments repertoire. Cellist Karine Georgian, a Rostropovich protégé and Tchaikovsky Competition gold medal winner, provides listeners with a deeply satisfying reading of this powerful composition. Her technique is effortless and precise, allowing listeners to focus on the sonatas many musical highlights rather than on its virtuosic demands. From the stratospheric highs to extended bass range of its scordatura tuning, Georgians instrument produces an even, powerful, penetrating sound that demands and maintains attention. Violinist Marco Rizzi joins Georgian for an equally provocative performance of the duo. Rizzi and Georgians sound blends together well, and the two match intonation, articulation, phrasing, and vibrato with precision. The duo, like the sonata, focuses on the enticing folk elements. Also on the disc is the interesting but perhaps less enjoyable Capriccio for solo cello, a work that is largely a study in octave playing. Georgian again tosses off a technically superb performance of an infrequently played work. Neither Karine Georgian, a pupil of Rostropovich and first prize-winner at the 1966 Tchaikovsky Competition, nor Pavel Gililov had come my way before on disc. But I hope such persuasive musicians will soon do so again. Their sympathy for Brahms equally as susceptible romantic and classical craftsman, struck me as of the unforced, intuitively perceptive kind. The two true cello sonatas are keenly contrasted. Unhurried tempos for the flanking movements of the earlier E minor work help to emphasise its gravity: I particularly enjoyed their reserved yet so very pregnant opening. And they find the droll charm of the Allegretto quasi Menuetto and the nostalgia of its trio without a trace of self-conscious coquetry. Balance, finely judged in the E minor work, sometimes goes against the mellifluously lyrical but not outsize-toned cello in the passionate F major Sonata. With its turbulently rich-textured keyboard part. Yet the two artists are so closely attuned in spirit that this did not seriously disturb me: so often Gililov brings an Ashkenazy-like translucency to the pianos upper register by way of amends. The laden Adagio id played with a totally committed intensity by them both and the songful finale has an endearing spring-like freshness. The bonus included is Paul Klengels cello transcription of the G major Violin Sonata Op 78. All three recordings were in The Maltings at Snape. The playing itself is refined and affectionate. Yet I still feel this music cries out for the violin. A particularly impressive refutation [of Tchaikovskys indifference to Brahms] has now come about through the collaboration of a former International Tchaikovsky Competitioon Gold Medal winner and the former victor of the National Piano Competition in Moscow. These artists are Karine Georgian, Moscow-born cellist and Rostropovich student of Armenian descent who has for the past decade been Professor in Detmold, and Pavel Gililov, Ukrainian-born Profess or of piano at the Cologne Hochschule für Musik and frequent guest artist at the Cologne Philharmonie. Some years ago, in the Maltings of Benjamin Brittens festival town of Aldeburgh, celebrated for its outstanding acoustics both as concert hall and recording venue, they recorded both of Brahmss Cello Sonatas, preceded by Paul Klengels elegant transcription of the Sonata Op 78 for violin and piano. This recording is now available from the British label Biddulph. Both partners exactly realise from the start the world-weary cantabile of the first movement of the Sonata in E minor Op 18, composed between 1862 and 1865. Here the cello part has to cope with many technical problems, abrupt transitions from the deepest to the highest registers of the instrument. In this recording the warm tone of Karine Georgians cello blends marvellously with Pavel Gililovs richly nuanced and poetic sound. Both artists offer a perfectly balanced interpretation with a wide spectrum of finely judged dynamic gradations and shades of colour. Their musical affinity shows itself especially in the charming gravitas, old-world courtesy and affecting rubato of the gently archaic quasi-Minuet second movement. The fugato Finale, in which Brahms pays his respects to Bachs Art of Fugue, receives a performance which, far from being coldly academic, almost goes overboard with temperament. Above all a debt of gratitude is due to these duo partners for bringing out from the shadows and illuminating the complexities of the Sonata No. 2 in F Op 99 of 1886, which already foreshadows the composers late works and points far into the future. The outer movements are full of passionate impetus; the middle movements  the F shap major Adagio with its ghostly cello pizzicati against heavy, hollow piano chords and its yearning cantilena, and the F minor scherzo with its sorrow-banishing humour  have affinities with the Romantic night-pictures conjured up by E. T. A. Hoffmann and Novalis. This interpretation places Brahmns as the composer of a rich oeuvre of chamber music in foursquare contradistinction to the noisy din of Wilhelminismus and the whole fin-de-siècle atmosphere of the age. Generally speaking, it could be an arguable point whether the G major sonata for violin and piano Op 78 deserves to have its sound world refashioned to the cello and piano version. But when Karine Georgians perfect double-stopping technique and sonorous tone allows the Brahmsian sixths to flower as they do here, and moreover when she has in Pavel Gililov a partner whose musical heart beats so much in unison  then such scruples simply disappear. This set was recorded more than ten years ago in London (the venue, The Warehouse, is a few minutes walk from Waterloo Station). I was bemoaning the fact that I had not come across this marvellous collection before, until I noticed the imprint (1st issue 2009) on the back of the booklet, advice both comforting and amazing [this release sounding sufficiently tempting for me to go online to buy it; I was surprised to find it available on Warehouse Records WR11545 001. Alto claims 1st issue as it has never been distributed commercially before  Ed.] Quite why something this good has not been snapped up already by a record label is difficult to fathom. The recorded sound is superb in its clarity, presence, balance and tonal faithfulness. The music is engrossing, unfailingly interesting, always recognisably by Martinu (who died fifty years ago) but without sameness or predictability , full of verve, whimsy and beauty. The three sonatas (1939, 1941 and 1952) are each in three movements; the first two perhaps reflect their times, No. 2 in particular being full of tension yet opening the door to optimism, and with long melodic lines that speak directly to the listener. The greatest sorrow is reserved for the slow movement, to which the finale is a scurrying foil, one not without an admission of folk music. Sonata No. 3 is perhaps the richest work here, economic yet touchingly nostalgic for Martinus Czech homeland (he was in Paris at the time), music full of heart and rhythmic ingenuity. Variations on a theme of Rossini (1942) begins stridently on the piano, the cello given the meat of the material (it was composed for Piatigorsky, and the theme used is a witty march from Mosè in Egitto); these are wide-ranging and imaginative commentaries on Martinus part. The Slovak piece (1959), and among the composers last music) is quite terse and intense but equally compelling. I have nothing but praise for the performances by cellist Karine Georgian and her pianist Ian Munro, which are deeply committed, meaningfully collaborative and fully appreciative of the musics personality. All in all this is a release (ridiculously late!) that is a joy in every respect. There have been a number of issues in 2009 marking the 50th anniversary of Bohuslav Martinus death, of which this is exceptional. 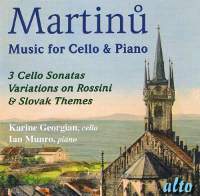 Without checking through Martinus very prolific output, I believe that this CD comprises  if not all, then  the best of this admirable composers works for cello and piano in performances of fine quality, very well recorded. Karine Georgian is a cellist of the front rank and she is here perfectly partnered by Ian Munro; the recording balance is excellent. The performances are really superb. The music is worth the attention of any music-lover, for Martinus work is invariably the product of an eminently sane, superbly gifted, composer, grounded in tonality but never boringly predictable. The three sonatas are similar in structure but are strikingly individual, and the two sets of Variations are delightful. Anthony Phillipss booklet notes are an added bonus, making this inexpensive CD eminently recommendable. Gripping recordings of Martinus complete works for cello and piano from the immensely gifted Russian cellist Karine Georgian. She was a Rostropovich student and amongst many honours gave the US premiere of the Khachaturian Rhapsody-Concerto with the Chicago Symphony, the composer conducting. In 1994 she gave the first performance in Australia of Brittens Cello Symphony. The three sonatas are concise three-movement structures. The First Sonata dates from around the time of the composers flight from Paris, ultimately to the USA. The wildness of the mood, the ominous storm clouds brought out by Australian pianist, Ian Munro  who has done so much for Arthur Benjamin and Malcolm Williamson  and the general feeling of hunted manic urgency recall the Double Concerto for Two String Orchestras, Piano and Timpani. The deeply rewarding Second Sonata has the dynamism and plangency (try the second movement) of the Fourth Symphony. The Third Sonata is a post-war work but is full of that hallmark meld of yearning and exuberance. The finale is truly exciting. Interesting to note the Beethovenian echoes in this work  paralleling similar voices in the Fifth Symphony. The two variation sets are just as passionately done and are very satisfying. The Slovak set dates from the year of the composers death while the Rossini sequence with its brazenly strutting finale belongs to his wartime output. Each set is about the length of a concert overture. The excellent notes are by Anthony Phillips. Those notes are studded with witty illustrations which enhance the package overall. Theres a fine informal photograph of a smiling and tousled Martinu on the back of the leaflet. The cover is an image of the place of Martinus childhood  the church tower of St James, Policka in the then Czechoslovakia. This is a fine and closely-recorded collection with obvious virtues  even at prices higher than those asked by Regis. John Ireland, whose life and music balanced on the cusp between the 19th and 20th centures, is often overlooked in favour of his contemporary Elgar and their more progressive colleagues in Europe. But this set, despite some roughnesses around the technical edges (notably the clarinets), is quite an Aladdins cave, revealing an imaginative and very personal musical style. The distinguished Russian string players prove Irelands strongest advocates, taking the music as seriously as Shostakovich, and performing with conviction; try the eerie beginning of the Trio No. 2. 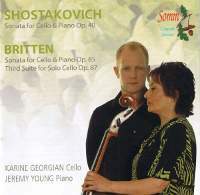 The second disc opens with a compelling performance from Karine Georgian and Ian Brown of the fine Cello Sonata of 1923. These admirable artists capture well this musics wistful, brooding atmosphere and are especially sensitive in the slow movement, a haunting evocation inspired by the landscape of the composers beloved Sussex Downs. After a sympathetic account of that popular miniature The Holy Boy (given in its 1919 guise for cello and piano), Lydia Mordkovitch teams up with Georgian and Brown to lavish immensely spirited, utterly dedicated advocacy on the three piano trios. These whole-hearted, affectionate performances receive characteristically ripe, realistic Chandos engineering. A very rewarding set. 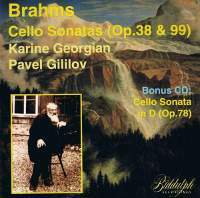 Karinne Georgian is an established cellist and pedagogue who on the evidence of this release deserves a wider audience. These three works  all written for her teacher Rostropovich  are given persuasive readings, although the recording is miked rather closely, thereby reducing the dynamic range of the playing. Brittens sonata, brilliantly written for the cello, deserves more frequent airings in the concert hall. It deploys a wide variety of techniques, and the musical fabric is closely worked, making for a compelling narrative. This well-rehearsed pair of players is elopquent and lyrical in the Elegy and is equally persuasive in the brittle Marcia, as well as offering an exciting and high-voltage interpretation of the saltando-clad Moto perpetuo. By comparison, Shostakovichs sonata is no stranger to the limelight, and is much recorded. Yet this account is unmannered, and adherence to the text is here of paramount concern. These artists give a particularly striking and vibrant performance: they are energetic and full of bravura in the Scherzo, and melancholically lyrical in the Largo. The finale is particularly brilliant, savouring the vintage Shostakovich wit and irony. Although the close recording makes the piano timbre a little harsh at times, the reading is sufficiently mercurial to overcome this obstacle. Georgian has recorded other works for solo cello, most notably the Kodály Solo Sonata, and its clearly a genre that suits her formidable cellistic prowess. Once again maintaining a faithful observation of the text, she delivers a perceptive account ofn Brittens Third Cello Suite, eloquently highlighting the motivic threads that unite the movements and projecting the music with strength and conviction. Russian cellist Karine Georgian was a pupil and friend of the late Mstislav Rostropovich, who recorded this Shostakovich sonata with the composer himself and for whom all Brittens cello music was written. So the insights she brings to these works, along with her innate refinement and technical expertise, make these unusually distinguished performances. Accompanied by Jeremy Young, her colleague at the Royal Northern College of Music, Georgians version of works at the heart of the cello repertoire rival any in the catalogue. I very much enjoyed reading Elizabeth Wilsons brilliant biography Mstislav Rostropovich: Cellist, Teacher, Legend (Faber & Faber 2007  reviewed last month), which was published just a month before Rostropovich died. It has been wonderful, therefore, to become better acquainted with the playing of Karine Georgian, one of the most renowned of Rostropovichs pupils in Class 19 at the Moscow Conservatoire. She features prominently in Wilsons book, having studied with Rostropovich for the nine years leading up to her winning First Prize in the Tchaikovsky Competition, and her reminiscences form one of the chapters. With this programme she inevitably challenges the seminal interpretations of these two sonatas recorded by her late teacher, and the comparison is a fascinating one, with Georgian often finding greater fluidity and displaying a wonderfully rich and velvet tone, while Rostropovich shows a greater variety of timbre and is the more terse, intense and physical, seeming less concerned about beauty of tone. In the Britten Sonata, for example, where much of the emotional content is predominantly bleak, Rostropovichs playing tends to be the more incisive, whereas Georgian almost seems to look back in time, finding a more romantic and sensual sentiment. Perhaps, as a result, theres less sense of drive and less immediacy with Georgian, as well as a loss of the secco playing which makes the combination of Rostropovich and Britten so invigorating. Nevertheless, her interpretation provides a fascinating and equally convincing alternative. Jeremy Young is entirely attuned to this approach, but it is Britten who achieves a greater clarity in the runs as well as a phenomenal degree of precision in the fiendish tremolos that close the first two movements. In the Third Cello Suite Georgians approach is similar again, more interalised and comparatively subdued, avoiding the overwhelming sense of concentration achieved by Matt Haimovitz, whose remarkable medium-price three-disc set, The Twentieth Century Cello, encompasses a vast range of works and composers and is an essential acquisition for all cellists. Perhaps Steven Isserlis marries the best of all worlds in this elusive and deeply spiritual work, combing tender lyricism with soul-searching intensity and demonstrating a staggering variety of timbre and tone. Regrettable, Rostropovichs rendition of Shostakovichs Cello Sonata, with the composer himself at the piano, is currently unavailable: it has rarely left the catalogue and one can only hope that it is being repackaged in another guise. Listening to it again (on LP) provided a similar experience to hearing the Rostropovich/Britten partnership, conveying a real sense of the music being created as it is performed. Shostakovichs pianistic abilities should not be underrated: the rapid scale passagework in the finale may be cleaner and more accurate in the hands of Jeremy Young, but the composer chooses to sacrifice accuracy in favour of excitement and momentum, and the result is utterly exhilarating. There is very little, if anything, with which to find fault in this new release: the recording quality is excellent, as are the programme notes by my colleague Robert Matthew-Walker, and the performances have a real integrity and commitment. Nevertheless, others have found more in these works, and I would not want to be without Roistropovichs versions of these two sonatas, especially when coupled with the quality of pianism and the inevitable authority of having the composers themselves at the keyboard. Georgian does not display the same talent for mischief as her master  her speeds are steadier and tone sweeter  but she still expresses considerable pathos and understated humour. The pianist Jeremy Young is a sympathetic collaborator. Shostakovichs Cello Sonata Op 40 has cartoon quick movements and a tortured largo, while Brittens Sonata Op 65 and Solo Cello Suite Op 87 are more sombre, the suite in particular passing like photos in an album.